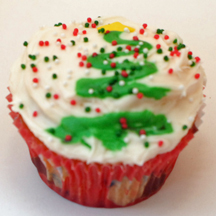 Here are some super-easy Christmas tree cupcakes with no decorating bag or tips required! Just buy green icing in a tube! How to Make It: Frost cupcake. Use green writing icing to draw zigzag pattern shaped like a tree (skinny on top, wide on the bottom.) You can add a trunk or leave it abstract. Place star confetti on top and sprinkle with sprinkles. This entry was posted on Thursday, November 6th, 2008 at 10:16 pm	and is filed under Christmas cupcakes. You can follow any responses to this entry through the RSS 2.0 feed. Responses are currently closed, but you can trackback from your own site.